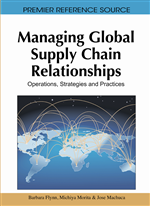 Since the inception of supply chain management, a primary objective has been the integration of the varied internal and external components (Langley & Holcomb, 1992; Cooper et al., 1997; Schmenner & Swink, 1998; Kahn & Mentzer, 1996; Lambert & Cooper, 2000; Min & Zhou, 2002). Due to the global span and impact of the supply chain, firms instinctively understood that the synchronized flow of materials and services, information, knowledge, and finance had the potential to produce desirable outcomes. Unfortunately, obtaining supply chain integration has been an elusive quest for many companies (Fawcett & Magnan, 2002). Unlike other endeavors that a firm undertakes, there is no blueprint for integration. To complicate matters, there are various existing definitions for supply chain integration (Narasimhan & Das, 2001; Pagell, 2004). Most commonly, this term is used to describe the degree to which organizations have eliminated boundaries from internal processes, and the extent to which information is shared between supply chain members. This definition, however, lacks a strategic focus. From a strategic perspective, supply chain integration is defined as the dynamic assimilation of enterprises and their customers and suppliers to determine, create, fulfill, and communicate customer value in the global environment. This definition implies an end-to-end connectivity that harmonizes supply from its very origin, all the way to delivery of products to the final customer. In today’s demand-driven environment, however, implementing this concept is difficult for a multitude of reasons. Tan (2001) stated that true supply chain integration requires a huge commitment by all members. For example, the purchasing firm may have to restructure its buying process to integrate a supplier’s engineering and product design teams directly into its decision-making process. Since the 1980’s, customers have been demanding improved levels of service. Firms that responded to this call learned that this strategic direction also provided them with sustainable competitive advantage (Li et al., 2006). Thus began the cycle of offering higher and higher levels of service, as customers became more sophisticated and demanding (Rich and Hines, 1997). In addition to being less willing to condone poor service, customers have also grown accustomed to customized products and services (Treacy & Wiersema, 1995). The ensuing proliferation of product and service offerings for a global market has created a tremendous amount of complexity for key supply chain activities, such as demand management, production planning, inventory management and order fulfillment (Lee, 2000; Wu et al., 2006). As if product proliferation were not enough to manage, product life cycles are also getting shorter and shorter. Products have four things in common including: (1) a limited lifespan; (2) distinct sales’ stages with different characteristics, (3) profits that increase and decrease through these stages; and (4) manufacturing, marketing, financial, logistics and supply chain management strategies that vary at each stage of the life cycle (Kotler & Keller, 2006). Managing these four components for a few or tens of thousands of products is a difficult task under any circumstance. The shortening of the product life cycle has added to the challenge. New products are being introduced at a pace that mirrors the rapid change in technology (Smith et al., 2005). It is not uncommon for the product life cycle of successive products to overlap, thereby producing a significant increase in the number of products that the supply chain is managing at all stages of their life cycles (Lee, 1996; Lee, 2000).